Visitors are always welcome at Charles Evans. 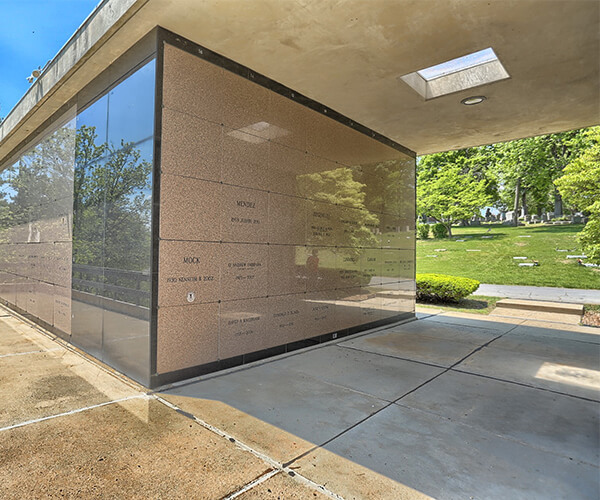 An experienced, courteous attendant is on hand every weekday from 8 a.m. to 5 p.m. to personally guide you through the cemetery and various buildings. 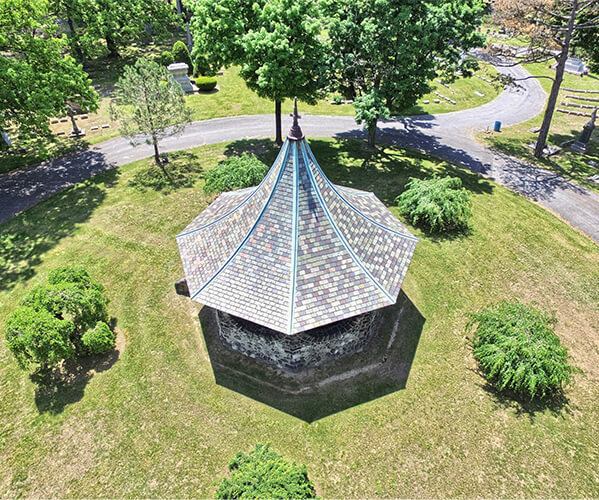 To understand the historical importance of Charles Evans Cemetery, an examination of its context within the garden cemetery movement is required. Prior to the advent of the non-sectarian garden cemetery movement, most Christian burials took place in church or denominational burial grounds. While these early public cemeteries were being established, there was a revolution in landscaping trends. The formal 18th Century estate gardens were giving way to a new movement – the romanticism of the 19th Century. The highly controlled beds laid in formal grids or geometric patterns were replaced with more natural looking shapes and meandering paths winding among a lush variety of plants, shrubs, and shade trees. The romantic movement in landscaping encompassed public burial grounds, and thus the garden cemetery movement was born. 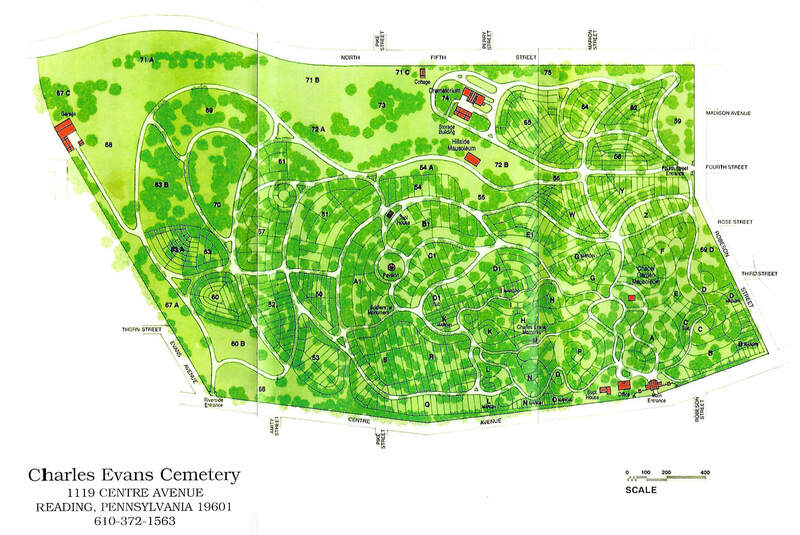 The importance of Charles Evans Cemetery as an early example of the public garden cemetery in the United States was established. Mount Auburn in Cambridge, Massachusetts, opened in 1831, served Boston and surrounding cities. Philadelphia’s Laurel Hill was the second garden cemetery, being incorporated by an act of the Pennsylvania legislature in 1836. 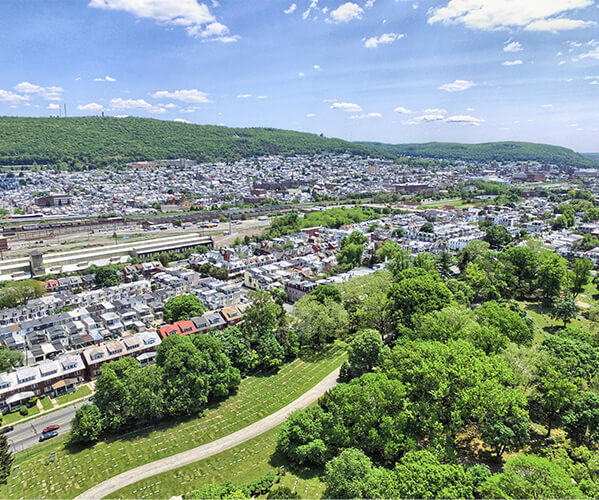 Ten years later, Reading followed Philadelphia’s lead with Charles Evans Cemetery, incorporated with a similar act of the General Assembly in 1846. Garden cemeteries, Charles Evans included, were used by the public not only for burial but also for the purposes of communing with nature and deceased loved ones. Sunday strolls through the beautiful grounds on pleasant days were standard for most families. It was not unusual to find entire families picnicking by a grave site. The garden cemetery evoked no ominous or morbid thoughts such as the old-fashioned church graveyard may have inspired. The opening of a horse-drawn railway (trolley line) in 1874 made the Charles Evans Cemetery more accessible to the general public. Activities such as strolling the grounds increased but certainly did not extend to ball playing or more active forms of recreation. In Reading, as elsewhere, it became evident that there was a need for public parks. Indeed, the garden cemetery movement is considered the forerunner of the public park movement. You would have to travel far and wide in Pennsylvania to find a cemetery as well stocked with mature trees as Charles Evans. The serene, park-like atmosphere of the cemetery has much to do with the great variety of both native and exotic trees that are thriving throughout the grounds. 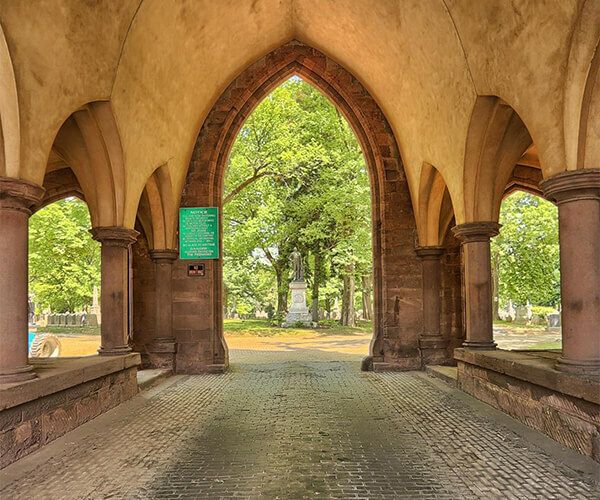 The cemetery is graced by a wide range of tree species arranged in natural patterns among the grave stones, monuments and winding roads and paths. A leisurely drive or walk through the grounds will reveal trees as young as just a few years growing beneath giants that were planted over a century ago. The list of species growing in this arboretum in the city is extensive, boasting many types of native shade trees including oaks, maples, tulip-poplar, basswood, sycamore and pine as well as more exotic species like katsuratree and Japanese pagodatree. Every spring, a multitude of flowering dogwoods comes alive in a pink and white display unrivaled by any park in Berks County. 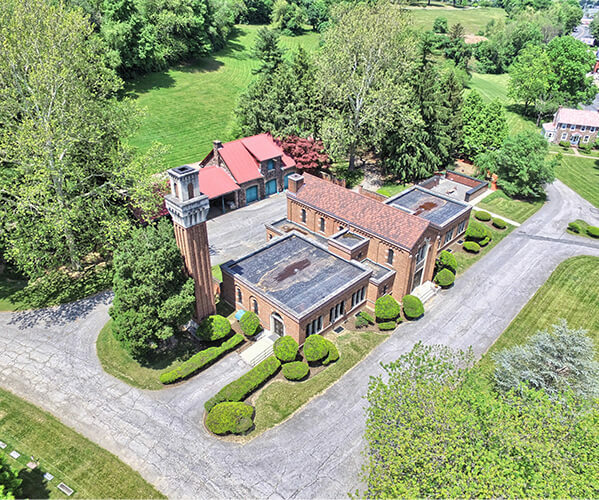 Charles Evans has the distinction of possessing five trees which are listed as champions on the Pennsylvania Forestry Association’s Big Tree List – a Chinese catalpa, turkey oak, English yew, bigleaf linden and a lacebark elm. A tree population of this size and diversity, in a public area hosting visitors every day of the week, needs to be well monitored and maintained to keep the trees safe, healthy and attractive. 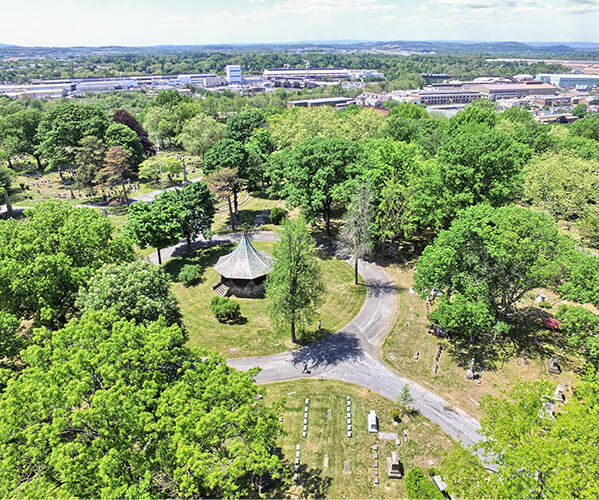 Trees are inspected frequently and routine maintenance performed, including removing dead limbs over roads and pathways, and elevation to provide clearance around monuments and open up vistas through the cemetery. It is also important to prune the youngest trees to train them into a structure that will require less attention in the future. Over time, all trees become over mature, begin to decline and need to be removed. All removals are performed safely and competently by professional contractors, with the stumps ground out to allow for replacement. We plant new trees with the goal to favor mostly native species but also to diversify for balance and aesthetics and also to guard against damage due to possible future pest or disease outbreaks. 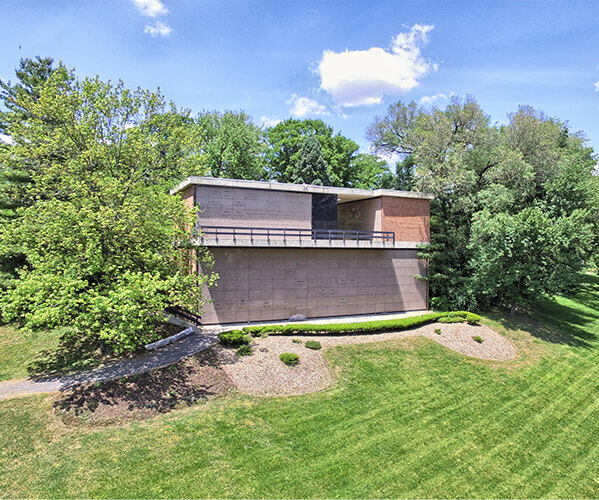 New additions in recent years include swamp white oak, black gum, river birch, white fringetree, hackberry and even the American elm which has been absent from landscapes for decades due to Dutch Elm Disease. Very attractive shade tree with heart-shaped leaves that turn apricot to yellow in fall. Female produces small, banana-shaped fruit in late summer. Native to China and Japan. Fast-growing evergreen. Long and soft needles are grouped in bundles of five. Valuable timber species. Only pine native to PA.
Often found in swampy locations. Lemon-scented flowers, borne in May-June, are creamy white. Red seeds in fall. Native to eastern United States. The whitest bark of all birches. Bark, which separates easily, has been used for utensils, canoes, and wigwam covers. Excellent yellow fall color. Native to North America. Handsome, small tree of singular grace and beauty. In May-June bears small, bell-shaped flowers which are pendulous. Foliage borne on upper part of stem. Native to China and Japan. One of the smallest pines. Usually found on dry, rocky slopes and ridge tops. Cones are long-thorned with hook-like, sharp, upturned edges. Native to United States. Small, flowering tree with spreading horizontal branches. Showy part of blooms are really bracts of white or pink which surround the true flower. Blooms April to May. Susceptible to many pests and diseases. Native to North America. Medium to large tree with rounded shape. Dense foliage and shallow roots. Leaves have five lobes. Handsome yellow leaves into late fall. Native to Europe. A pyramidal, medium to large tree. Red fall color. Considered drought tolerant. Native to United States. Can become massive. Upright spreading branches form rounded outline. Poor dingy brown fall color. Flaking bark similar to Sycamore. Native to Europe and western Asia. A tree of great adaptability which will grow in clay soils and withstand drought. Unusual acorn cups have scales that bend backward. Native to southern Europe and western Asia. Fast-growing oak of value to parks, golf courses, and commercial areas. Can reach height of 60-75’. Wood used for many purposes. Native to United States. Lovely fan-shaped leaves yellow in fall. Fruit of female tree gives off foul odor. Able to withstand pollution. Has survived unchanged through 150 million years of evolution. Native to China. Lovely tree when in leaf; nice shape and outline. Can have outstanding fall color. Quite messy when it drops its fruit. Susceptible to several insects and diseases. Native to United States and Mexico. This is a magnificent specimen. Red, exfoliating, stringy bark reflects the age of this tree. Yews are one of the most ancient of trees with some estimated to be 3,000 to 4,000 years old. Foliage, bark, and seeds are very toxic to people and all classes of livestock. Native to Europe, northern Africa, and western Asia. Also called Chinese elm. Excellent, tough, durable tree growing 40 to 50’ high. Exfoliating bark often a beautiful mottled combination of gray, green, orange, and brown. Native to China, Japan, and Korea. A very tall (up to 150’) member of the Magnolia family. Somewhat weak-wooded. Flowers resemble tulips and are often borne high in the tree in May to early June. Aphids are a real problem. Native to United States. One of the best of the larger shade trees. Used for making maple syrup. Valuable hardwood durable enough for flooring. Native to Canada and United States. Used as specimen because of interesting, irregular form and decorative orange-red bark. Favorite subject for bonsai. Two needles per bundle. Native to Japan, Korea, and China. Also known as Beetree Linden. Large tree for public places. Often confused with American Linden. Native to United States. Large tree which produces inedible nuts. Very showy white flowers in long bunches produced in early to mid-May. Huge, sticky dark buds. Susceptible to leaf blotch. Native to Europe. Also called Mossycup Oak because acorns are deeply enclosed in a cup which is fringed on the edge. Massive trunk in maturity. Native to United States. Graceful and compact, narrow pyramidal. Horizontal branches, often pendulous. Shortest needles of the spruces. Splendid ornamental tree. Native to Asia. Giant species with pendulous branchlets. Loses form with age. Commonly used as windbreak. Regarded as valuable timber tree. Native to Europe. A large tree with a massive trunk and creamy white mottled bark and large maple-like leaves. Can grow over 100 feet tall. Native along rivers in eastern and central U.S. Medium sized tree with maximum height usually 60 to 70 feet. Leaves are compound with small leaflets, turning yellow in the fall. Most of the honeylocust in Charles Evans bear large, extremely sharp thorns. These trees were bred by crossing different elm species in an attempt to resist Dutch Elm Disease which decimated the American elm population. Large, pyramidal tree with smooth gray bark and purple-green leaves in the summer. Nuts are favored by squirrels and other wildlife. A shrubby tree growing to a mature height of 12 to 20 feet. Beautiful white flowers are borne on 6-inch long panicles in early June. The dark blue, Y.i-inch fruits are devoured by birds from August to September. Large, upright shrub or small tree. Leaves are blue-green in fall, turning yellow-red-purple in the fall. Flower stalks are abundant all summer, giving the tree an unusual smoky pink appearance. Charles Evans Cemetery holds an amazing array of bird species. From raptor to warbler in type, and from resident to migratory are the reasons for being seen here. What draws our avian friends to these 120 acres with approximately 7 miles of paved roads to walk is not a mystery. The elevation, though not the highest location of the County, is one of the highest in the City, and a significant contributing factor. This habitat also harbors varied trees and shrubs as nest sites, protection, or rest stops along a migratory route. Flowering plants, rich earth and dead wood also act as an endless supply of food. The cycle of bird life is full with predator and prey species, and now becomes complete with you the observer. Shaded cemeteries have always been productive places to bird and Charles Evans Cemetery is certainly no exception. The grounds and trees come alive with color and song in the spring and much continues throughout the other seasons. The setting always seems to bring peace to the soul but that symphony of bird songs and spectrum of colors soothes the heart and mind as well. Take time and find this magic for yourself. This project of bird identification is the collective vision of Anna Marino-Hehn, artist/community activist; and Jack Holcomb, past president of the Baird Ornithological Club. They approached James C. Hart, cemetery superintendent with their idea and it won the approval by the Board of Trustees of Charles Evans Cemetery in June of 2009. Trusted by Berks County since 1846. Exceptional Beauty. Peace of Mind. Dedicated to the People.